We had a double celebration at St. Catherine’s Residential Care, Balwyn on Saturday, August 18, 2018 for Margaret Case, who was celebrating her 80th birthday and Diamond Jubilee (60 yrs) as a Sister of Charity of Australia. Sr Cate O’Brien had prepared a very beautiful and simple liturgy honouring Margaret, who was surrounded by her Sisters of Charity family and her family members. The Sisters read their Vows with Sr Margaret and then Sr Cate presented Sr Margaret with her Papal Blessing. 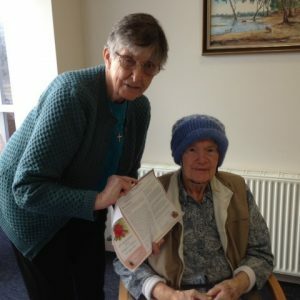 Sr Margaret was heard to express these words: “I am so overwhelmed, thank you, thank you, thank you!” The smile on her face told the story. 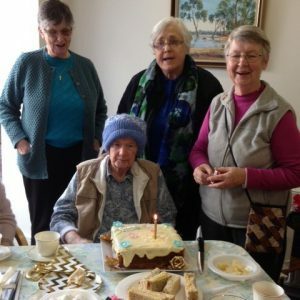 Afternoon tea followed as the Sisters acknowledged the other Sisters in Sr Margaret’s batch who were also celebrating in Brisbane and Sydney. Especially, they remembered Srs Patricia Carr, Bernadette Culhane, and Trish Shinners, who would have been smiling down from Heaven. Days like August 18 bring so much joy to those celebrating such an achievement. Those present eventually moved away from the party with hearts full of gratitude to God and Mary Aikenhead for our Jubilarians. Images: Sr Margaret Scully gives Sr Margaret her Papal blessing; Sr Margaret and her Sisters, from left, Sr Patricia, Sr Cate, and Sr Mary Gabrielle Clarke.